The Environmental Archaeology Program has a long history of interest in the use of appropriate archaeological methods for the recovery of animal remains. Early research by Wing showed that recovery of the full complement of animal remains is often best achieved by using fine gauge screens (Wing and Brown 1979, Wing and Quitmyer 1985, Wing and Quitmyer 1992). More recent work by Quitmyer and EAP affiliate Betsy Reitz also shows that secondary estimates of diversity, trophic level, and others can be invalid when carried out on samples that are not representative of the full assemblage of animal taxa (Quitmyer 2004; Reitz et al 2009). Most of this work has been done in coastal or other water-edge areas and the increase in taxonomic diversity is primarily found among the small boney fishes. Such tests are less common at inland sites where the predominant fauna are large mammals or other large boned species. 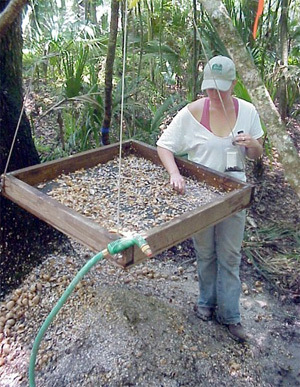 Emery has continued in this tradition, beginning a program of recovery method testing at Maya sites with graduate student Erin Thornton to examine the efficacy of fine gauge screening in lowland and highland tropical deposits. Her studies have shown so far that the increase in rate of recovery of remains is highly variable. At the site of Trinidad some 64% of the remains were recovered only in the fine gauge screens (47% of which were fish compared to only 1% in the unscreened assemblages) whereas at the site of Motul de San Jose only 4 kilometers away, fine gauge screens recovered little or no remains in any deposit type. Similarly at the highland site of Kaminaljuyu, screened samples recovered remains only at the 1/4-inch and nothing was found at finer gauges. Emery’s earlier studies in the Petexbatun found that even 1/4-inch screens returned little or no remains while at other sites fine screening significantly increased the proportion of small species (Emery 2004). 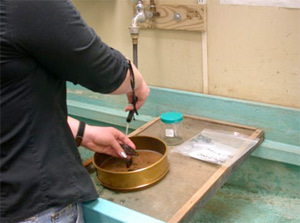 Given the time and expense required for fine gauge screening, as well as the potential for damage to the remains caused by such screening (particularly in the clay sediments of the lowland tropics) Emery suggests approaching the question of appropriate recovery screen gauge on a case-by-case basis by testing each site and deposit type using nested screens rather than proposing site-wide 1/16-inch screening based on recommendations from coastal and lacustrine areas. Cannon, M. D. (1999) A Mathematical Model of the Effects of Screen Size on Zooarchaeological Relative Abundance Measures. Journal of Archaeological Science 26:205-214. Davis, S. J. (1987) Methods and Problems in Zoo-Archaeology. The Archaeology of Animals. New Haven, Yale University Press:21-46. Emery, K. F. (2004) Making the Most of the Data: Issues of Method and Theory in Tropical Zooarchaeology. Archaeofauna 13:7-10. James, S. R. (1997) Methodological issues concerning screen size recovery rates and their effects on archaeofaunal interpretations. Journal of Archaeological Science 24:385-397. Quitmyer, I. R. (2004) What Kind of Data are in the Back Dirt? An Experiment on the Influence of Screen Size on Optimal Data Recovery. Archaeofauna 13:109-129. Special Issue: Tropical Zooarchaeology, K. F. Emery and W.G. Teeter, eds. Reitz, E. J. and E. S. Wing (1999) Zooarchaeology. Cambridge: Cambridge University Press. Schaffer, B. S. (1992) Quarter-Inch Screening: Understanding Biases in Recovery of Vertebrate Faunal Remains. American Antiquity 57:129-136. Wing, E. S. and A. B. Brown (1979) Paleonutrition: Method and Theory in Prehistoric Foodways. New York, Academic Press. Wing, E. S. and I. R. Quitmyer (1992) A modern midden experiment. 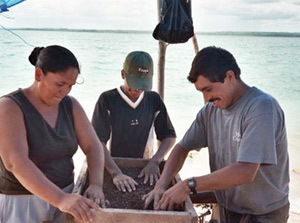 Culture and Environment in the Domain of the Calusa. W. H. Marquardt. Gainesville, FL, Institute of Archaeology and Paleoenvironmental Studies: 367-373. Wing, E. S. and I. R. Quitmyer (1985) Screen size for optimal data recovery: A case study. Aboriginal Subsistence and Settlement Archaeology of the Kings Bay Locality. W. H. Adams. Gainesville, FL, Department of Anthropology, University of Florida: 49-58.